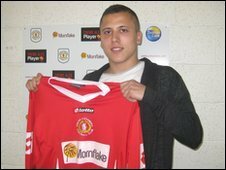 Crewe Alexandra have made teenage midfielder Antoni Sarcevic their first signing of the summer. Sarcevic, 18, has joined the Alex for an undisclosed fee from Unibond First Division side Woodley Sports. "It's a dream come true for me," he told the official website. "[Crewe manager] Dario Gradi has seen something in me and hopefully I can repay him." Sarcevic, who was offered a trial by Blackburn in September, made over 40 appearances for Woodley last season. He has signed a one-year contract, with the option to extend that by a further year. Meanwhile, former Alsager Town, Kidsgrove Athletic and Leek Town striker Jimmy McCarthy has accepted the invitation to join the Alex for pre-season training at the end of May. McCarthy impressed in a recent trial match for Crewe, scoring twice against Burton Albion.